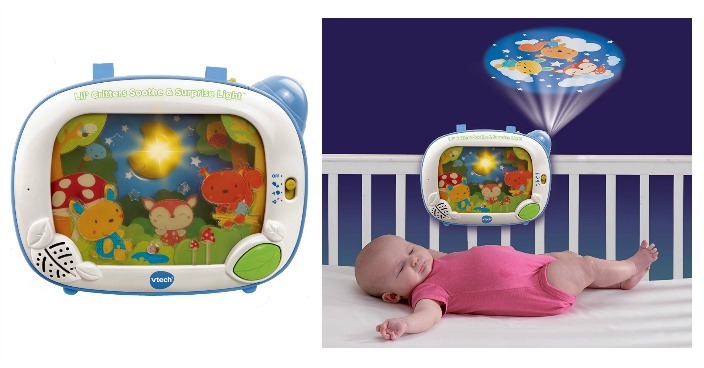 VTech Baby Lil' Critters Soothe & Surprise Light Just $7! Down From $22.50! You are here: Home / Great Deals / Christmas Deals / VTech Baby Lil’ Critters Soothe & Surprise Light Just $7! Down From $22.50! VTech Baby Lil’ Critters Soothe & Surprise Light Just $7! Down From $22.50! Amazon has this VTech Baby Lil’ Critters Soothe & Surprise Light on sale for $7 (Reg. $22.50)! Please keep in mind that his toy is an Add-on so you must check out with at least $25 in your cart! The Lil’ Critters Soothe and Surprise Light by VTech sends your baby off to sweet dreams. Gentle nature sounds and music from the soothing night light calm your baby, while two peaceful animal images project on the ceiling to provide visual stimulation and comfort. For relief during the night, a soft crib light creates more than 10 glowing patterns and animal images, and when your baby cries, this baby crib light’s built-in sensor activates calming sounds and melodies. The music player soothes your baby to sleep with over 65 soothing lullabies, nursery rhymes, melodies and nature sounds. Program the music in 10, 20, or 30 minute intervals using the time selector switch. It’s off to dream land with your Lil’ Critters! Operates on 4 AA batteries that are included.